When AxesInMotion released the first version of Extreme Car Driving Simulator, this game became a big hit among car lovers. Its sequel, Real Car Driving Experience – Racing Game, now offers even better simulation. Play Real Car Driving Experience on PC or Android to experience the new and improved realistic physics engine. For the most part, this game is more about driving simulation rather than racing. It’s the place to go rogue and break a bunch of traffic rules without the fear of getting caught. If you are a stickler for the rules, just play to teach yourself how to drive around sensibly. Whatever makes you tick behind the wheel, this title from AxesInMotion offers some fun action on four wheels. The creators of this game have had a love affair with racing sports cars since inception. Real Car Driving Experience on PC will be no different. You will get a chance to drive some of the coolest sports cars to ever grace the screen. Get your hands on a hypercar and find out how it feels to drive one of the fastest automobiles on the planet. Off-road trucks might not be the fastest, but they certainly offer great traction on any surface. You’ll get a nice selection of lightweight cars, which are not only quick but also inexpensive. Gold and cash are the rewards you get for playing. These rewards will help you add new cars to your garage. In addition, you can use your virtual cash to pick up some nice upgrades for your car’s engine, suspension or brakes. Admittedly, driving alone does not sound like an impressive incentive to play a game. But, Real Car Driving Experience has some nice features that will make it worth your while. For once, there are three different 3-D locations to explore. Get inside the Looping Airport to burn rubber on the runway tarmac or drive around on asphalt in the sprawling Los Saltos City. If you want a different experience, take a 4WD off the beaten track to explore the tranquil Off-Road Hills. In every location, you will find ramps to drive off and perform jaw-dropping stunts. 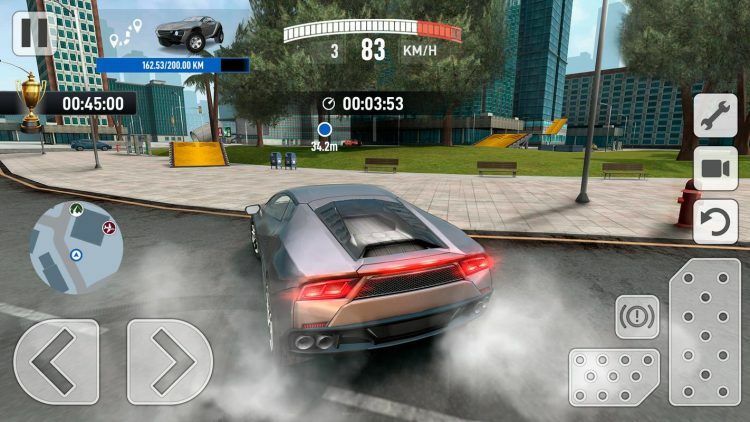 The game’s HUD also indicates distance covered, your speed, and driving time. What’s more, different camera angles in this game allow you to drive the way you like, be it with cockpit or exterior views. Like in most games, there are ads in the free version of Real Car Driving Experience on PC. Other ads just take up screen real-estate but the opt-in video clips come with an extra reward. Play these video ads and you get a chance to double your rewards or speed up crate opening. You will come across glowing, colorful crates that appear randomly on the streets. These crates have rewards such as upgrade points for your car’s power, control and brakes as well as coins and vehicle blueprint cards. Drive into them to claim your free prize. You can only have a maximum of 5 crates, so only collect them if there are empty slots. Stop by those blue cylindrical holograms to take on a checkpoint challenge. These timed missions test you on your speed and driving agility. You must beat the clock to earn a Bronze, Silver or Gold medal. However you perform, checkpoints offer a chance to collect free cash and gold. When you see yellow arrow street signs, follow them. The arrows are your guide in checkpoint mode. You have to follow them to avoid veering off and losing the challenge. When driving freely, they will point you to ramp and crate locations.